Storm is a Golden Retriever who walks with his human near Port Jefferson Harbor. When he jumped into the water and started swimming towards a baby deer that was out far from shore, his human, Mark Freeley grabbed his cell phone and started the video rolling. Indian elephants, it turns out, are natural swimmers. But this one appears to have been swept out to sea some 16 km off the coast of Sri Lanka. This was a dangerous situation because it may not have had the strength to return to land, and prolonged exposure to sea water could have damaged its skin. Fortunately the Sri Lankan navy was able to perform a rescue. Not a simple operation! 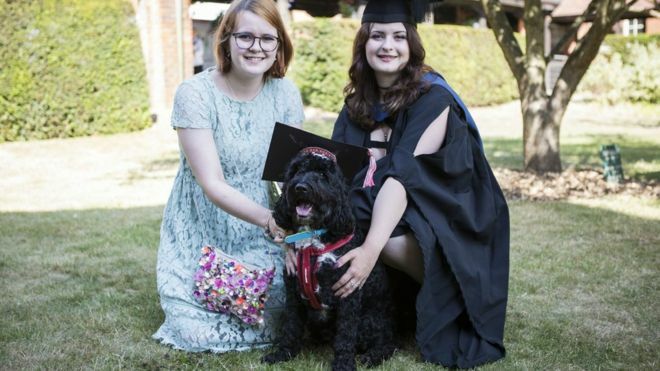 Boris the dog is a constant companion of Hollie Evans (19), who suffers from anxiety. Boris distracts her and helps her remain calm, even under challenging circumstances like the college graduation of her sister, Daisy. So Boris would fit right in at the school, he was fitted with a mortarboard for the day. Want to stop your dog jumping up on people? Don’t be too hard on him or her. Apparently it’s just a common behavior that starts in puppyhood. And if no one teaches the dog otherwise, that same behaviour often continues into adulthood. Not too bad if it’s a small dog, but it can be a real problem with larger ones. Dog trainers say the caring owner needs to set boundaries early in the dog’s life. It’s inevitable. There are places you need to go and things you need to do where your canine companion just won’t be welcome. It’s great that a few employers these days actually welcome the presence of a pet at work. Most don’t. And you certainly can’t leave a dog cooped up in your car. In most areas that’s now illegal, to say nothing of inhumane. Does your dog love to fetch? It’s in the genes. During the course of domestication, evolution worked on dog genes to adapt them for life with humans. Since then, humans have taken a greater hand. Even before genetics was established as a science, humans had been shaping the size, colour and temperament of their pets through selective breeding. Science is still interested in the genetics of dogs, especially dog behaviour. A recent study carried out by Scottish scientists led to the discovery that the ability to fetch shows strong inheritance from parents to pups. Ghost the cat had gone missing. Signs advertising the lost kitty had been posted all over her home town of Sackville, NB, so many people were on the lookout for the orange tabby. Weeks had gone by and her human had begun to fear the worst. Then a wonderful surprise. 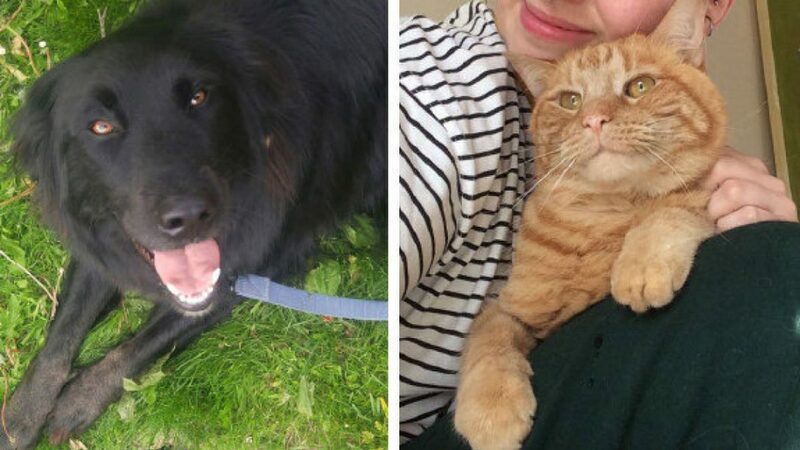 The owner of a Black Lab x Border Collie named Cash called to say her dog had found Ghost.